Every time we visit the local pet center, we face hundreds if not thousands of dog foods. Food for puppies, dry food, semi-moist food, meals for dogs, prescription diets, organic food, food with added nutrients, therapeutic diets, canned food, meals in sealed packets, chicken flavor, dog food with chicken, chicken dog food, kibble…the list goes on and on in terms of ingredients, flavors, textures, types, quality and prices. But what makes certain dog food a better option than the rest? And how to make the right choice? With so many commercially available types and brands, all using different wording and marketing claims, going dog food shopping can be a rather daunting and challenging task. Even though there is no ideal food and ultimately everything comes down to what your dog needs and what is most practical for you, to make things easier, we have reviewed few important steps towards the right decision. First of all, you need to consider several different variables such as age, breed, body composition, gender (including whether neutered or not), temperament, activity level and last but not least – taste preferences. The perfect food is supposed to be the ideal balance of the six major nutrient groups: proteins, carbohydrates, fats and oils, vitamins, minerals and water. More often than not, we forget to pay attention to the label and check out the ingredients list of the dog food we purchase. Being the manufacturer’s primary means of communication with you, as dog parent, the food label is of crucial importance. Although it may sound like a no-brainer, always look for a statement indicating that the food is specifically made for dogs. Dogs have particular nutritional needs and require certain things in their diets. Commercial dog food is required to be nutritionally complete/balanced, meaning the food can be used as sole source of nutrition because it contains all necessary nutrients for your dog to grow and thrive. You do not need to worry about deficiencies, unless your dog has specific issues that require special diet or supplements. One of those special diets is the low protein diet. As previously mentioned, protein is an essential nutrient that all dogs need to grow and maintain normal bodily functions. Proteins are made of amino acids. Amino acids are the building blocks in a dog’s body. Dogs require 22 amino acids, 12 of which they can synthesize on their own. The other 10 amino acids (essential) must come from the diet. Dogs suffering from certain chronic health conditions, have limited ability to digest those amino acids. For them, too much protein can be detrimental. Health issues that require special low protein diets include: chronic kidney disease, acute kidney failure, glomerulonephritis, Lyme-disease associated nephritis, nephropathies and other inflammatory kidney diseases, porto-systemic or liver shunts, hepatic encephalopathies, cirrhosis, Cushing’s disease, congestive heart failure and some types of urinary stones. Low protein diets are also indicated for naturally aging dogs, large dog breeds at risk of overgrowth and obese dogs that need to lose weight. Addressing health concerns with corresponding diets, not only extends your dog’s survival period, it also increases their quality of life. However deciding your dog has to eat low protein foods must be medically supported. Low protein dog food is generally not recommended for healthy dogs. Therefore, low protein diets, are not available over the counter. They can only be recommended and prescribed by a licensed veterinarian. Regardless of what your vet prescribes, as a responsible dog parent, you should always monitor your dog’s body weight and condition. 1. Brand – we are all brand-driven purchasers. When it comes to health products, opting for a proven brand is always a smart choice. Stick to a brand you know and trust, even if it costs a few extra bucks. 2. Quality – as previously mentioned the diet must contain high-quality, easily digestible proteins. Preferred high-quality protein sources in low protein diets include chicken, eggs, fish, soy, dairy and beef. 3. Balance – pay attention to all ingredients and not just the proteins. Make sure the diet can be used as a complete meal and it does not contain harmful ingredients such as meat by-products, generic fat sources like animal fat or chicken fat, artificial preservatives, colors, flavors and harmful sweeteners like sucrose or corn syrup. 4. Palatability – since most of the flavor of the food comes from the protein, dog foods with limited proteins can be rather tasteless. Buy small amounts of several different brands and let you dog decide which one it prefers. However, do not offer him too many varieties all at once, as it may lead to upset stomach and gastric pain. 5. Nature of the dog food - the good news is that low protein dog food is manufactured in both dry and canned varieties, so finding a tasty option for your dog is not that hard. Most dogs prefer canned food since it has a more appealing smell and greater amount of animal preservatives. On the other hand dry food is easier to measure and buy in bulk, has a longer shelf-life and usually more nutritious. Whatever you decide on, make sure you understand how to compare canned food with dry food. For example 18% protein on the label of wet dog food is not the same as 18% protein on the dry dog food label. Canned food is generally much higher in protein than dry food, even though it may appear otherwise when comparing the labels. 6. Flavor – always choose the flavor your dog wants. To avoid unwanted digestive issues, pick a flavor you dog has previously eaten. The most popular flavor in low protein foods is chicken. Go with it, before trying new flavors such as – turkey, salmon or duck. 7. Appropriateness – believe it or not, even dog food shopping comes with rules. One of the most important rules would be to never buy puppy food for an adult dog and the other way around. Certain food product serves as a complete and balanced meal, but only for a specific developmental period of your dog’s life. In a nutshell, puppies should eat puppy foods, adult dogs should eat adult dog foods and seniors should eat senior dog foods. Low protein puppy foods are specially formulated for fast-growing bodies while those for older dogs are useful for joint care. 8. Phosphorus levels – low phosphorus levels are also important for maintaining the kidney’s health and proper function. However, low-phosphorus diet should be supplemented with enough B vitamins, potassium, antioxidants, buffering agents and omega-3 fatty acids. Environmental conditions – dogs who spend time outside in the cold, depending on the temperatures, usually use 10-90% more energy than those who live indoors or in temperate climates. TIP: If buying low protein dog food online, choose a good and reputable company with a return policy. To make things even simpler and easier for you to understand we have compiled a list of the 10 best low protein foods for dogs, available on Amazon. 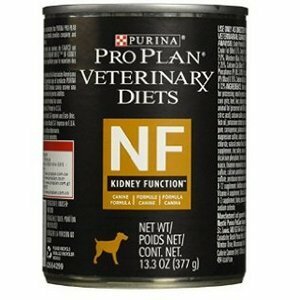 The Purina NF Kidney Function Canned Canine Formula is scientifically formulated to help minimize the signs of kidney failure and slow down the disease’s progression. To support proper and healthy kidney function it has low protein levels, low phosphorus levels, reduced sodium levels and high omega fatty acids levels. Low protein levels help reduce the workload of the kidneys. Low phosphorus prevents kidney damage, while reduced levels of sodium help compensate the damaged kidney’s inability to regulate this important mineral. Increased levels of omega-3 fatty acids help reduce glomerular hypertension. The added B-complex vitamins help by protecting the body and ensure the easy break down of nutrients. Additionally, it serves as a complete and balanced source of nutrition for the maintenance of adult dogs. Purina NF, Canned Dog Food’s first 5 ingredients are water sufficient for processing, meat by-products, rice, corn grits, and beef. The formula is indicated for dogs with acute and chronic kidney disease, hepatic disease associated with encephalopathy and for dogs suffering from any condition that would benefit from restricted sodium levels. Royal Canin Gastrointestinal Low Fat Canned Dog Food is a specific nutrient blend developed by nutritionists and veterinarians. It is specifically formulated to reduce acute intestinal absorption disorders and promote nutritional restoration and convalescence. The formula contains easily digestible, high-quality proteins that can be readily absorbed by the dog’s digestive system. The fact that it is low in fiber, adds to the easy digestibility. The diet includes hydrolyzed yeast, fructooligosaccharides and zeolite, which nourish the intestinal tissue and microflora. It also has important vitamins and minerals to help reestablish natural balance in the gastrointestinal system, while building strong environmental defenses. Royal Canine Gastrointestinal also helps maintain healthy weight. The first 5 ingredients of the formula are water sufficient for processing, pork by-products, rice flour, corn grits, and corn meal. 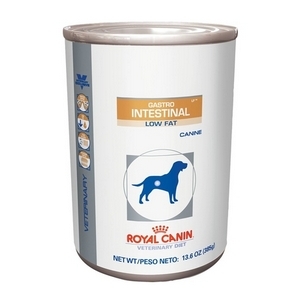 Royal Canin Gastrointestinal Low Fat Canned Dog Food is indicated for dogs suffering from acute and chronic pancreatitis, acute and chronic diarrhea, hyperlipidemia, lymphangiectasia, oxidative enteropathy, exocrine pancreatic insufficiency, bacterial overgrowth, and bile acid deficiency. 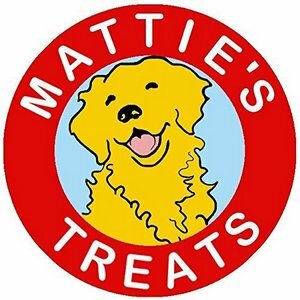 Mattie’s healthy treats for dogs with kidney disease are specifically designed to complement prescription diets. They use simple, natural ingredients to provide low protein and low phosphorus, tasty treats. All dogs love the real pumpkin and cinnamon taste. Mattie’s healthy treats for dogs with kidney disease contain light rye flour, tapioca flour, pure pumpkin, cinnamon, omega 3 fish oil, and canola oil. Formulated by veterinarians, you can rest assured that the Hill's Prescription Diet® k/d® Kidney Care dog food is made for the best interest of your furry buddy. This prescription diet includes brown rice, Brewers rice, pork fat, cracked pearled barley, and chicken as its five main ingredients. Brown rice and Brewer's rice are slow-burning complex carbohydrates, which means it boosts your dog’s energy levels all the while making him feel full for much longer. Likewise, barley provides energy as well as dietary fiber, which promotes proper digestion and regular bowel movements. Combined with pork fat for flavor and chicken for protein, your furry buddy will surely enjoy munching his new dog food. What is more, this prescription diet features E.A.T. (Enhanced Appetite Trigger) to ensure your pet will maintain a normal appetite despite his condition. What is more, this dog food contains l-carnitine to aid the conversion of fats into fuel as well as omega-3 fatty acids to promote heart health and cognitive function in your dog. Most importantly, this dog food is formulated with controlled amounts of phosphorus and sodium to ensure each meal won’t tax your dog’s kidneys. Furthermore, this dog food features essential amino acids so your dog can sustain strong, lean muscles for fun and play. With the Hill's Prescription Diet® k/d® Kidney Care dog food, your furry buddy can enjoy a happier life for much longer. 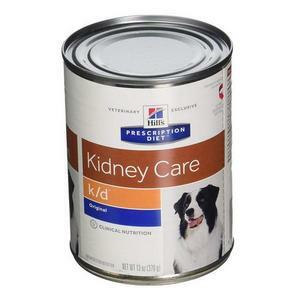 Purina Veterinary Canine NF Kidney Function Dry Dog Food is specially formulated for normal operation of your dog's renal system. It is a clinical diet, designed to help manage chronic renal failure and its complications in adult and ageing dogs. Nutrients such as low sodium, potassium and boosted omega-3, omega-6 bolster the dog’s health, while specifically focusing on the urinary tract. Reduced sodium levels compensate the functionally deprived kidney's capacity to regulate this important mineral. 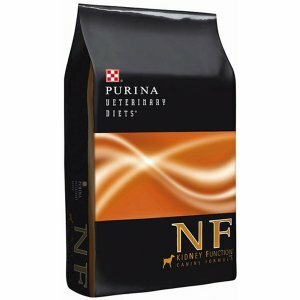 Purina Canine NF decreases the production of nitrogenous waste products, which also aids the kidney’s proper functioning. Purina Canine NF is indicated in cases of chronic renal failures, renal failures associated with Lyme disease, early stages of heart diseases, hepatic diseases associated with encephalopathy and conditions that require restricted dietary sodium. With more than 40 years working experience, Royal Canin is leading expert in the health nutrition area. Its product, Royal Canin Urinary SO is a complete and balanced diet for adult dogs formulated to aid in the nutritional management of calcium oxalate and struvite urolithiasis. The formula promotes a urinary environment unfavorable to the development of both struvite and calcium oxalate crystals. It is designed to ensure the production of a urine undersaturated with struvite and with a level of calcium oxalate saturation at which spontaneous homogeneous crystallization will not occur. The first five ingredients include brewer's rice, corn, chicken by-product meal, chicken fat, and natural flavors. Additionally, the diet is enriched with omega-3 fatty acids to aid your dog's urinary tract to fight infection and inflammation. 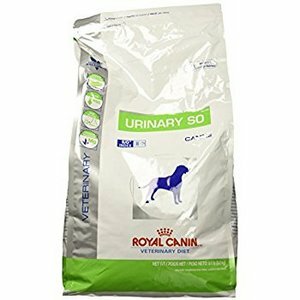 Royal Canin Veterinary Diet Canine Urinary SO Dry Dog Food is indicated for dogs suffering from Lower Urinary Tract Disease (LUTD). LUTD refers to a number of health situations that lead to irritation of the urinary tract. Among the most common causing issues are bacterial infections and urinary stones. The formula successfully addresses both causes. 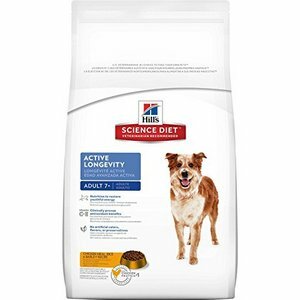 Hill’s Science Diet Adult 7+ Active Longevity is a dry food that provides precisely balanced nutrition for dogs age 7 and older. It’s easy to digest ingredients promote youthful vitality. Hill’s Science Diet Adult 7+ Active Longevity is Veterinarians’ #1 choice to feed their own pets. The diet is also popular among owners of dogs that need low protein foods. The first five ingredients in this food are chicken meal, whole grain wheat, whole grain sorghum, brewer's rice and brown rice. The food is enriched with omega 6 fatty acids and vitamin E for skin and coat quality improvement and glucosamine and chondroitin for healthier joints and easier mobility. Contains corn, which in the ingredient list is labeled as "whole grain"
Natural Balance Limited Ingredient Diets Dry Dog Food is made of hormone-free bison meat – famously known for its high-quality protein content. The type of protein in bison meat is low on calories. That is why this diet makes overweight, inactive dogs achieve an ideal weight, while maintaining high energy levels. The food also contains sweet potatoes, as an adequate energy and potassium source. 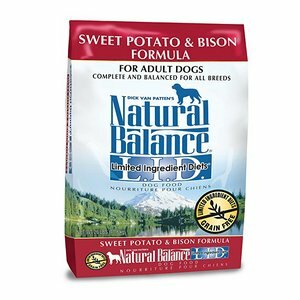 Natural Balance Limited Ingredients Diets Dry Dog Food – Sweet Potato & Bison formula, is a grain-free diet, perfectly suited for dogs in any life stage. The diet is an excellent source of DHA, which keeps your dog’s brain sharp and focused. Additionally, the formula promotes healthy skin and a healthy, shiny coat. Does not contain artificial ingredients, colors or preservatives. Premium Edge Foods are made with the finest and freshest ingredients. Their foods contain no ground corn, wheat or soy. The number one ingredient in every Premium Edge’s formula is real meat. Ingredient #1 in this specially formulated premium dog food is lamb. Other major ingredients in this formula include lamb meal, oatmeal, whole grain brown rice and cracked pearled barley. This real lamb combined with healthy vegetables offers your senior dog optimal nutrition and health. The formula is enriched with omega fatty acids which provide healthy skin and coat, potent antioxidants for overall good health, taurine for a healthy heart, and glucosamine and chondroitin for healthy joints. In a nutshell, this meal is packed with good nutrition. 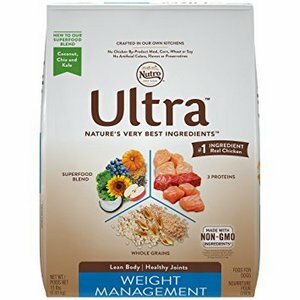 According to many kidney dog food reviews, Nutro Ultra Weight Management Adult is one of the best low protein dog foods available on the market. The main reasons for this are the food’s finest quality organic ingredients. They promote and support skin and coat quality, heart health, vision and healthy immune system status. Specially made for overweight and less active dogs, this food provides 100% complete and balanced nutrition for adult maintenance. Contains three lean animal proteins from farm-raised chicken, pasture-fed lamb and salmon, which provide unique and complementary amino acids that work together to promote strong, lean muscles. Nutro Ultra Weight helps overweight dogs achieve and maintain an ideal weight. The high vegetable content of this dog food is responsible for preventing the buildup of fat that could result from high-calorie diets. The plants included in this low-protein dog food are carrots, beet pulp, spinach, pumpkin and tomato. It also contains natural antioxidants, essential vitamins and Nutro Ultra Weight Management has an excellent, delicious taste that mimics the real food’s original taste. That is why your dog thinks that it is still eating much and tasty while healthily losing weight. Holistic Select has been focused on using the finest natural ingredients fruits, vegetables and healthy proteins to support healthy digestion, for more than 10 years. Its food is made with prebiotics, probiotics, natural fiber, digestive enzymes & digestive botanicals to promote overall health. Holistic Select Natural Dry Weight Management Dog Food is considered to be super premium dog food. 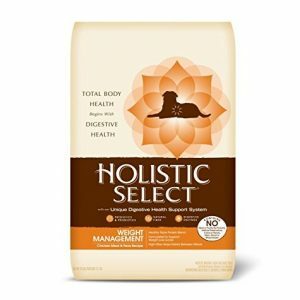 Holistic Select Natural Dry Weight Management Dog Food is a natural dry dog food specially formulated for overweight dogs. The brand’s unique Digestive Health Support System includes active probiotics, healthy fibers and digestive enzymes combined with high-quality natural ingredients like chicken and peas. Made with fewer calories, this food helps support healthy weight loss goals. From a quantitative point of view, low protein foods as the name suggests, do not contain many proteins. However, from a qualitative point of view, low protein foods must contain proteins of high-quality, because only high-quality proteins have a good balance of all essential amino acids. There is theory suggesting that dogs can tell when their food lacks certain amino acid and will avoid such meal. Grain-free diets are recommended for dogs sensitive to grains. Additionally, dogs find certain grains to be hard to digest. Consuming such grains over a longer period of time causes damage to the lining of the digestive system, which results in bowel inflammation disorders, food sensitivities, food allergies, leaky gut and obesity. However, it all depends on your dog’s health status and the type of grain used in the food. For example, while corn, soy and wheat are considered to be cheap fillers, barley and quinoa are considered to be "super foods". Our knowledge of the relationship between diet and health advances every day. Additionally, the range of foods available to dogs continues to expand. Therefore, it is important to base our feeding choices on good, science-based information. 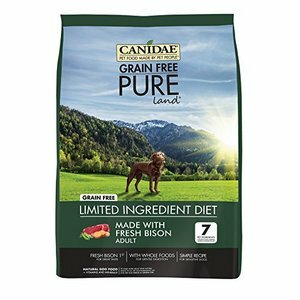 Canidae Grain Free PURE with Bison is a simple diet specially formulated for adult sensitive dogs. It is a limited-ingredient formula, made with only 7 key ingredients. It contains bison, lamb meal, sweet potatoes, peas and chickpeas. Bison is a high-quality and novel protein source, perfect for dogs allergic to common protein sources. The lamb meal fortifies the protein source. Sweet potatoes are a great carbohydrate source. Peas and chickpeas are fiber-rich legumes. The caloric content of the food is 1.686 kcal/lb or 474 kcal/cup. 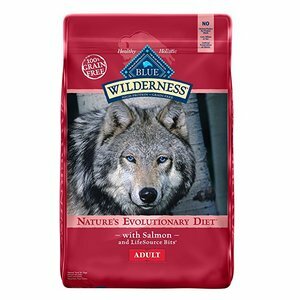 Blue Buffalo Wilderness Adult Grain-Free Salmon Dry Dog Food is a healthy alternative to a raw diet. 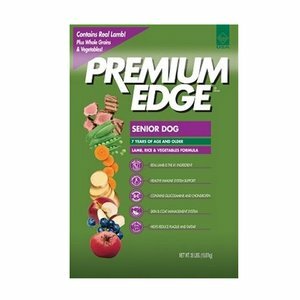 It is one of the best low protein diets for adult dogs. The first five ingredients are deboned salmon, chicken meal, tapioca starch, peas and Menhaden fish meal. Salmon is a high-quality protein source, rich in omega-3 fatty acids. Chicken meal is a meat concentrate, high in proteins. Tapioca starch is a gluten-free starchy carbohydrate. Peas are fiber-rich legumes. Menhaden fish meal is a healthy omega-3 fatty acids source. The caloric content of the food is 3.587 kcal/kg or 415 kcal/cup. What percentage is low-protein dog food? A majority of commercial dog foods, particularly maintenance dog foods for adult dogs, have a 25% protein content. A prescription diet, on the other hand, should fall between 18% - 23% to be considered a low-protein dog food. However, the amount of protein is not as important as the actual quality and ease of digestion of the protein in the food, says Dr. Lindsey Edwards, MVB, BSC, IVCA. How to make low-protein dog food at home? The following is a low-protein recipe you can prepare at home. But first, consult your veterinarian so he can make a few adjustments to the recipe in order to suit your dog’s specific needs. Cook the rice. The ratio of rice to water is 1:1. Hence, you’ll need a cup of water for every cup of rice. Cook the rice for 20 minutes in a slow cooker. Prepare the other ingredients while you wait for the rice to cook. Cook the meat. Cook your preferred meat until it becomes brown in color. Set aside to cool. When your pet has kidney woes, it is wise to opt for red meats as they contain less phosphorus compared to white poultry meat. Prepare the organ meat. Bring a saucepan filled with water to a boil. Afterwards, add pork or chicken liver to the boiling water and drain the water as soon it’s cooked. Rinse the organ meat using cold water and drain. Don’t forget to chop the organ meat into fine pieces. Set aside. Boil the vegetables. Boil the carrots until they are tender. You may also use pumpkin, broccoli, or whatever vegetable your pet prefers. Also, you may just combine them all together. Dice them into smaller pieces afterward or toss them in a food processor. Mix all ingredients. As soon you’re done preparing the ingredients, combine them all in a large mixing bowl. Make sure it is large enough so you can mix the ingredients thoroughly. Extra tip: Choose fresh vegetables rather than canned or frozen ones. Fresh vegetables have more vitamins and no added salt. Add calcium and fish oil supplements. Crush a 1,000 mg calcium supplement until it becomes fine. Afterwards, add it into the mix. You also need 1,000 mg worth of fish oil. Hence, squeeze one or two fish oil capsules into the mixture. A majority of dogs are suffering from nutrient deficiencies due to their disease and hence, it is recommended that you incorporate supplements into your dog’s meal. Nevertheless, consult your veterinarian beforehand. Store the food. Pack your homemade low-protein dog food using small airtight bags. Afterwards, store them in the refrigerator. You can keep the food for up to two months if you store them in the freezer. Each bag should contain your dog’s recommended daily food intake. Don’t forget to reheat your dog’s food. Extra tip: You need to consult your veterinarian to know the right amount of food your dog needs on a daily basis. What dog food has low phosphorus? There are times when you need to feed your pet commercially-made dry dog food. The best options include the Hill's nutritionists and veterinarians developed Prescription Diet® k/d®. This particular dog food is low in phosphorus and low in sodium. On the contrary, it is high in essential amino acids for muscle development and Omega-3 fatty acids for heart health. Moreover, this diet is specially calibrated for dogs with renal problems. Apart from minimally added salt, this dog food is fortified with vitamins and minerals to optimize your dog’s energy levels and immune system. Are eggs high in phosphorus? Yes, which is mainly due to its yolk. One large egg can supply roughly 95 mg of phosphorus but without its yolk, it only supplies a meager 5 mg.
What foods should a dog with kidney disease eat? Choose a dry dog food made with high-quality ingredients that are easy on the stomach. Don’t skip on protein. Your dogs still need protein for maintaining muscle mass and other bodily functions. Chicken and turkey are good protein sources; however, white meat tends to contain more phosphorus than red meat. Hence, it is best to opt for red meat such as lamb or lean beef as much as possible. Second, make sure it contains salts that are carefully balanced to minimize the workload given to your dog’s kidneys. If you prefer whole foods to dry dog foods, then opt for slow-burning carbohydrates such as sweet potatoes, pumpkin, and carrots, all of which also supply a good dose of vitamin A. Make sure to add some berries to your dog’s diet as they contain a plethora of antioxidants such as vitamin C, which help restore the pH balance of your dog’s blood. Lastly, opt for red meat for protein as these foods contain lower phosphorus levels than white meat. You can rest assured that your dog’s longevity is optimized by feeding him these foods. What are the signs of kidney disease in a dog? What foods should be avoided with kidney disease? Stay away from cheap dog foods made with poor quality ingredients such as meat by-products, cereals, and a bewildering list of ingredients. These foods are a challenge to digest. Apart from that, these foods supply a staggering amount of metabolic waste products, which the kidney has to process and excrete. Dogs with renal problems should also avoid foods high in sodium and phosphorus, such as jerkies, dairy, rawhide treats, and any food containing wheat gluten. When choosing dry dog food, make sure to feed your dog low-sodium dog food. Where to buy low protein dog food? You can browse for low-protein dog foods on Amazon, but you can also check the shelves of your nearest pet store. How much protein should a dog with kidney disease have? According to Dr. Christie Long of PetCoach, there is no exact recommended protein level. On dry matter basis, recommendations may range between 14% to 20% protein depending on the stage of your dog’s renal disease, your dog’s level of urine protein, etc. When your dog loses protein through his urine, restricting his protein intake too severely won’t be beneficial. Instead, choose a high-quality and digestible protein that won’t be broken down into waste products.